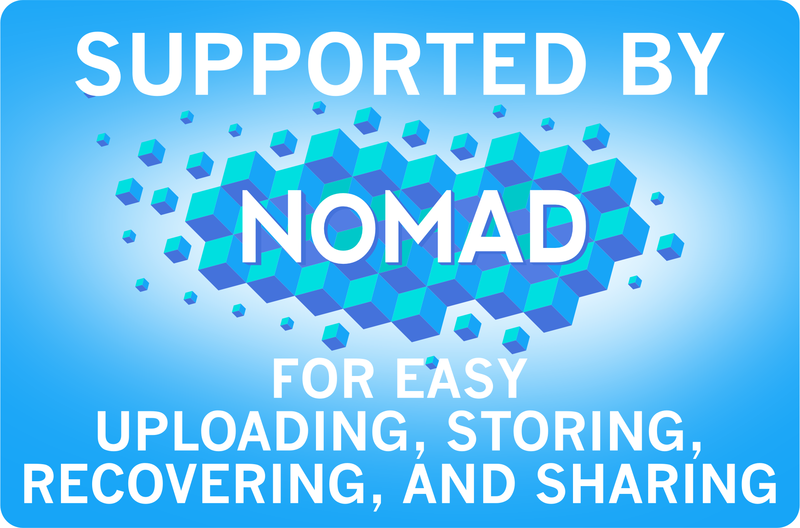 Purpose: In this tutorial, the NOMAD Repository will be introduced. 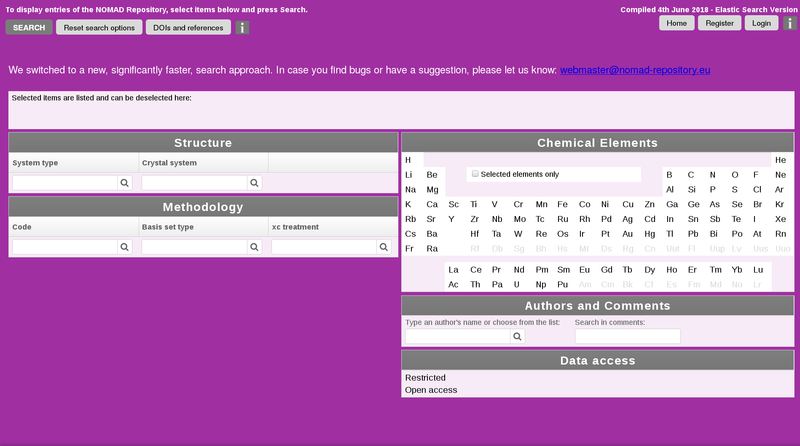 Furthermore, it will be explained how to use it for searching and downloading results of ab-initio calculations. The best and more fruitful way to follow this tutorial is to have two windows open at the same time, one showing the tutorial itself, and the other one showing the NOMAD Repository webpage. In this way, the user will be able to follow the instructions of the tutorial on one page, and jump to the other page to apply them. The Novel Materials Discovery (NOMAD) Project is a European Centre of Excellence which is aimed to developing tools for material science and engineering. 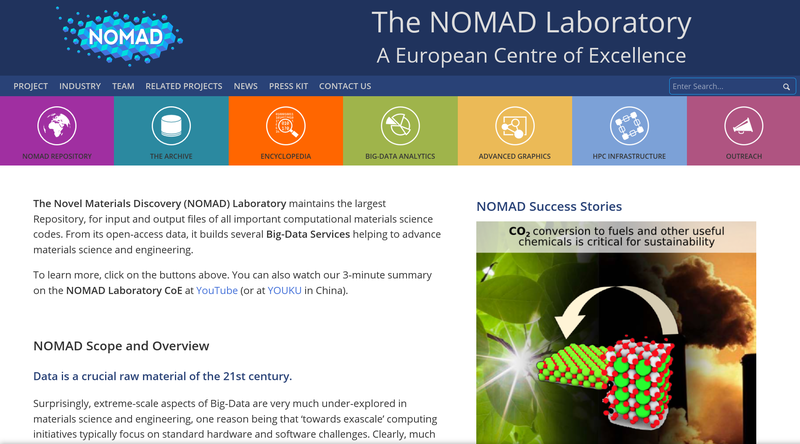 In particular, the NOMAD Laboratory develops a Materials Encyclopedia, Big-Data Analytics, and Advanced Graphics Tools. Eight complementary computational materials science groups and four high-performance computing centers form the synergetic core of this Centre of Excellence and participate in the development of the NOMAD Project. 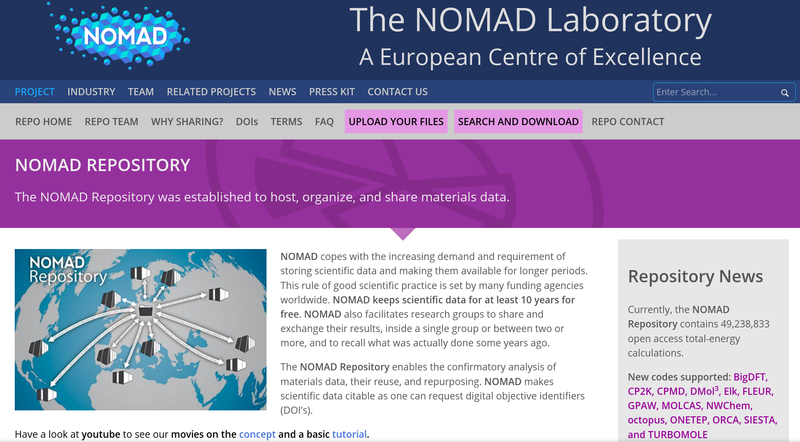 The NOMAD Repository is the part of the NOMAD Project which was established to host, organize, and share materials data. By following the link to the repository webpage, you see the following on the screen. In particular, the number 49,238,833 in the right panel indicates the actual number of open-access calculations which are contained in the repository. In order to proceed with the search, proceed to the NOMAD Repository webpage and click on the SEARCH AND DOWNLOAD button in the horizontal command bar. A new page will appear with the search queries. As a first example of search we will look for all calculations in the repository which are performed on systems containig both the lithium and fluorine atoms and using the exciting code. In order to do that, start your query by clicking the lithium element (Li) in the periodic table in the section Chemical Elements. Wait a few moments which are used by the searching machine of the repository for sorting your query. Then, using the same procedure, add the fluorine element (F). Notice that after each choice, the field of remaining elements will be restricted to the ones for which calculations are present in the repository, compatibly with the choices you have already done. Now, click on the lens symbol in Code of the Methodology section and choose the exciting code. You may notice that all your current queries appear in the left top part of the screen. Here, if you wish, you can delete one or more topics from the query list. If you want now to procede with the search, push the Search button on the top left margin of the screen. After a few moments the results of your search will appear on the screen. Two datasets and four calculations appear on the top and bottom panel, respectively. The content of a dataset can be visualized by clicking on the dataset itself. The calculations belonging to that dataset will then appear in the bottom panel. By clicking again on the dataset, we go back to the original result of the search, as in the previous figure. Here, we choose to concentrate on the last item of the calculations panel and we click on the corresponding Show button. A new small window will appear. Among the indicated files you can select those you want to download by first clicking on the corresponding small icons. Finally, for the download, click on the Download selected files button. The selected files will be now in your computer. Find all the calculations in the repository performed on systems containing vanadium and oxygen, using GGA as xc functional and numeric AOs as basis set. Find all the open-access calculations in the repository performed on systems containing exclusively sulfur, carbon, and hydrogen, using (L)APW+lo as basis set. Which code was used to perform these calculations? Does the result page show datasets? If yes, what is their content? In this section of the tutorial you will learn how to upload your data to the repository. However, in order to allow for errors and even wrong files to be uploaded, we will use a local "copy" of the repository which is disconnected from the official one. Therefore the first step to do is to use a separate server with the following procedure. Second step: In order to upload your own data, you need to login into this local version of the Repository. The account for each person will distributed in the computer lab. You can log in with your account by pushing the Login button on the top right margin of the screen. If you log in, the menu on the top right margin of the screen will be changed as follows. You can change your E-mail account and password by clicking the My account button there. The Account details window will be shown. As an example, see the below screen. Click the Change button for E-mail account and password, enter your information and finally push the Submit button. Now click Back to search button to go back to the front page of the GUI. Click the Uploads button on the top right margin of the screen. Then, a new small window will appear. You can follow the instruction on the window to upload your own data. (Please read carefully the whole instruction.) First, make sure that you agree with our term of use at the first line inside the window and click on the check box in front of the line. Finally, if you push the Show curl upload command button, you will see the example of the upload command. For the next step, you need to prepare a target directory as your first uploading example. This should be done by command line interface on a Linux shell. Open a console screen and move to the directory where you located the files downloaded at the previous step. In the below example of shell commands, such the path of the directory for the downloaded files is supposed to be $HOME/Downloads. Make a new directory there and copy all the target files into the created directory. Copy the command from Upload window on the GUI screen and paste it on you shell prompt and change the name of folder, "folder1 folder2 …" to 1st_upload_example. You can see the example command in the browser which you can execute. You will get the messages about your upload process. Check the inbox of your E-mail. You might receive the E-mail that reports the status of your upload process. If the process is done successfully, now you can go to check your data on the GUI. It will take 5 minuets until you data is visible on the GUI. Select the My uploaded data and push the Search button. Then, you can see your data if the process was done successfully. 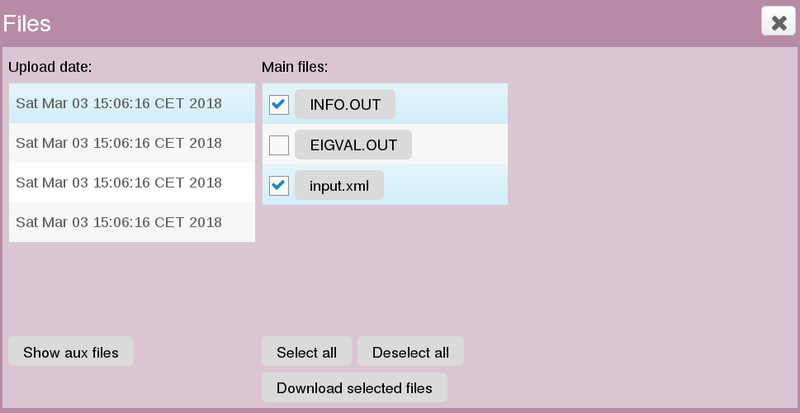 Upload other exciting output files that you have generated during the previous tutorials. Instruction for RESTRICTED_MM file: All uploaded data will be open access by default. 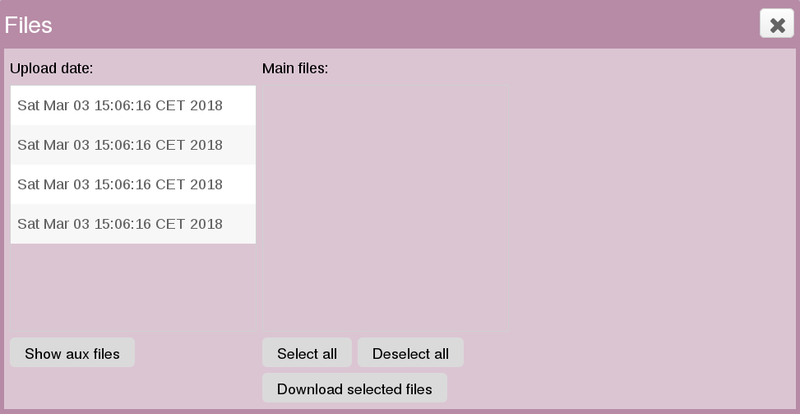 To make them restricted upon upload, the user must provide an empty file whose name is RESTRICTED_MM, where MM is a number running from 01 to 36, indicating after how many months the data will become open access. The RESTRICTED_MM file must be put in one of the parent folders inside your upload. All the files in this upload will be restricted. In order to start creating a Dataset, reach to the page of My uploaded data view: selecting the My uploaded data and push the Search button. You can see your data if the process was done successfully. Actual process of creating the Dataset starts with selecting the entries of your data that you suppose to be belonged into one Dataset entry that you are going to create. Then, click Create dataset button. A small box will appear and you can enter the name of new Dataset there. Push the Proceed button. As the last step, select the create dataset, and check the belonged entries if they exists in right way.